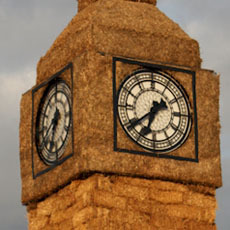 Big Ben Recreated in Straw! We've all heard of strawbale homes, but Snugburys, a UK ice-cream retailer has refined the art of strawbale sculpture. This year they have recreated Big Ben. 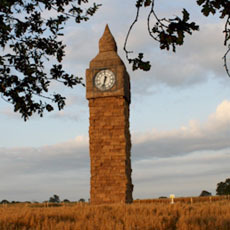 The landmark is celebrating 150 years, so what better way to celebrate than to build a 22 metre, 20 tonne Big Ben from roughly 500 straw bales? The 'model' Big Ben has a working clock that even lights up at night. It will be recycled when it is taken down at the end of the year, and has all been done to raise money for charity. If you're local to the area it can be seen from the A51 Chester Road.